Highlights from the final between Rodger Federer and Marius Copil. 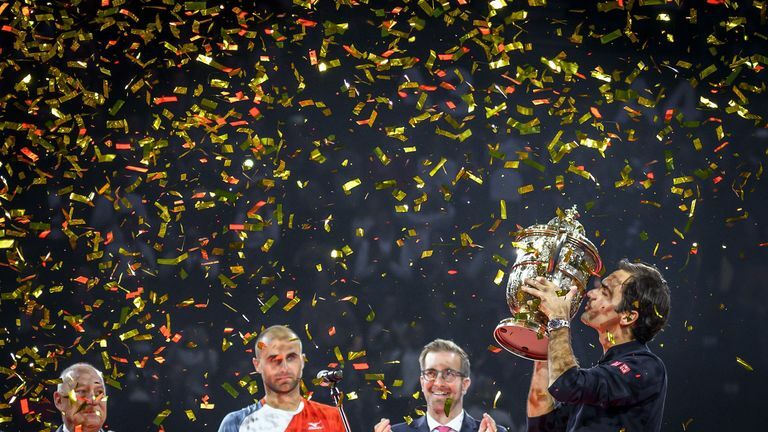 Roger Federer won the 99th tour-level title of his career on home soil at the Swiss Indoors in Basel on Sunday. Federer was given a stern test by world No 93 Marius Copil but still won 7-6 6-4. Only Jimmy Connors (109) has more tour-level titles than Federer, who claimed the top prize in Basel for the ninth time. It appeared for long periods like Federer would not be allowed to cruise to the title. Copil broke his serve early in the match, then forced a tie-break which eventually went Federer's way to decide the first set. But 20-time Grand Slam champion Federer roared back, first levelling the set before securing the crucial break of serve to move 5-4 ahead. Kei Nishikori lost his ninth consecutive ATP final after Kevin Anderson won 6-3 7-6 to claim the Erste Bank 500 title in Vienna. World No 11 Nishikori's luckless run means that a win in Memphis in 2016, his second career title, remains his most recent. Additionally Anderson earned a spot at the Nitto ATP Finals in London. Anderson will join Rafael Nadal, Novak Djokovic, Juan Martin del Potro, Federer and Zverev at the tournament, with two spots still up for grabs. Nishikori remains in the race to London, along with Marin Cilic, Dominic Thiem and John Isner. Wimbledon runner-up and world No 8 Anderson is having a career-best season and won his fourth career title. He will finish inside the world's top 10 at the end of a calendar year for the first time. Earlier this month, Nishikori lost in the final of his home tournament at the Japan Open.